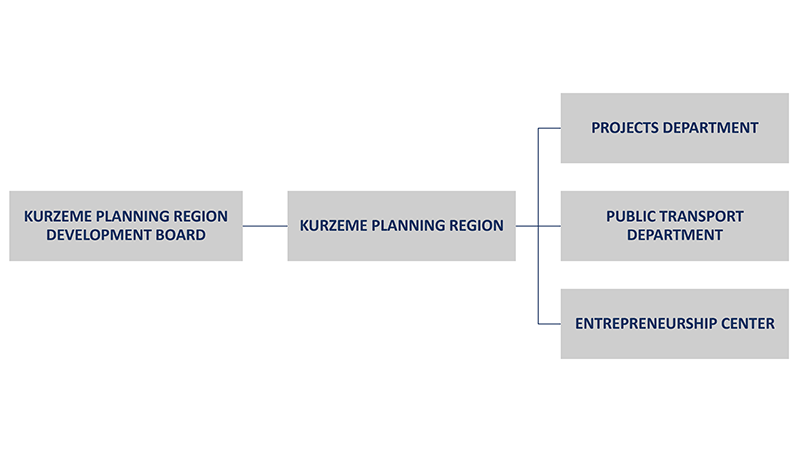 Kurzeme Planning Region (hereinafter – KPR) is a subordinated public entity under supervision of the Ministry of Environment Protection and Regional Development (hereinafter – MEPRD) dealing with planning and coordination of KPR, public administration in the area of public transportation in compliance to its competence, cooperation among municipalities and other state administration institutions. KPR was registered in the Register of Taxpayers on August 15, 2006 under code 90002183562. KPR is a legal entity subject to public law, it has its stamp displaying the full name of the region. Operation of KPR is regulated by the Law on Regional Development and other regulatory acts, Regulations of KPR and applicable Law on Territory Planning. The territory of KPR comprises the following administrative territories: 18 districts – Alsunga, Kuldīga, Skrunda, Grobiņa, Rucava, Nīca, Priekule, Vaiņode, Durbe, Pāvilosta, Aizpute, Saldus, Brocēni, Dundaga, Talsi, Roja, Mērsrags and Ventspils districts as well as 2 big cities – Liepāja and Ventspils. The body with decision authority of is the KPR Development Board (hereinafter – Development Board), the executive institution – KPR Administration (hereinafter – Administration).